Why go to the hassle of putting together party bags when we can do it for you? We buy in bulk meaning that not only do our party bags take some of the stress out of organizing a party, they are great value too. Best of all, you only pay for the number of children that turn up on the day! We have two options, basic and deluxe. 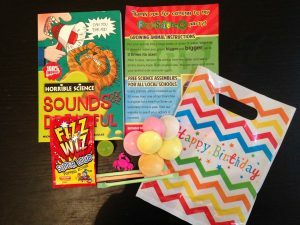 Popping candy, a bouncy ball, sherbet sticks, a growing animal and a ‘Horrible Science’ book. Please note that Fun Science Cheshire, Fun Science West Lancs and Fun Science Bury/Rochdale DO NOT currently offer party bags, apologies for any inconvenience.